It's been a while since posting and I'm definitely looking forward to doing so more! 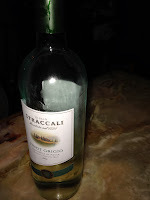 This weekend I had a fantastic girls night out with outstanding food and well priced and tasty wine. If you have not already, I recommend that you go to Panza in the North End. It is some of the best food you can find in Boston. We waited until the last minute to make a reservation, so we ended up with an 8:30pm one. Lucky for us, the cute restaurant sat us in the window so we could enjoy the warm October night. A little known fact is that Panza is the sister restaurant to the cash only, wait on line, outstanding Giacomo's across the street. Aside from the well priced, tasty food, it is nice to be able to make a reservation and pay with a credit card. 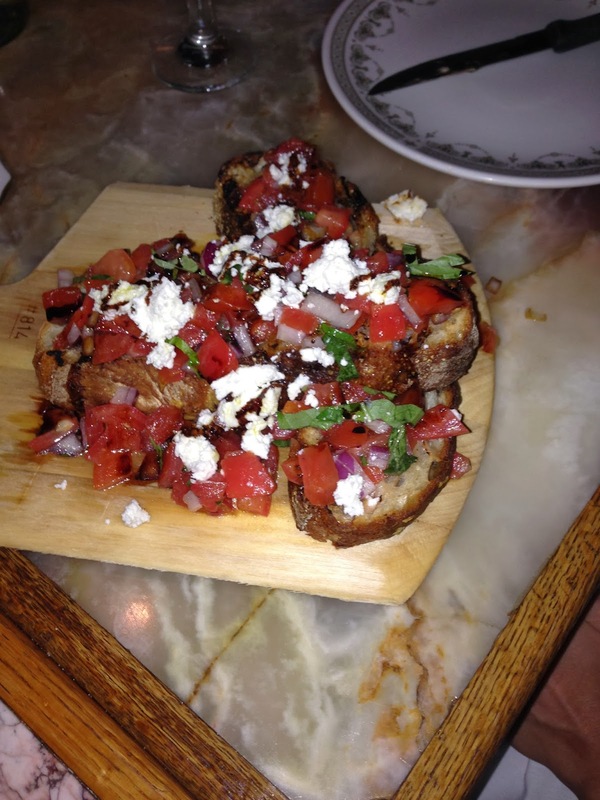 Once we sat down, the bright red stack of bruschetta at the other table caught our eyes. To start we ordered the goat cheese bruschetta My dining partner ordered Caesar salad. While we waited for our apps to arrive we ordered a bottle of Pino Griggio for only $20 and lined our stomachs with the crusty Italian bread and good olive oil. I am not usually one to order goat cheese, but the bruschetta was creative, light and the goat cheese was a perfect compliment to the smoky, toasted bread, garlicky diced perfectly ripe tomatoes and onion. There were two pieces of bruschetta which was perfect for the three of us to share and still have room for our entrees. 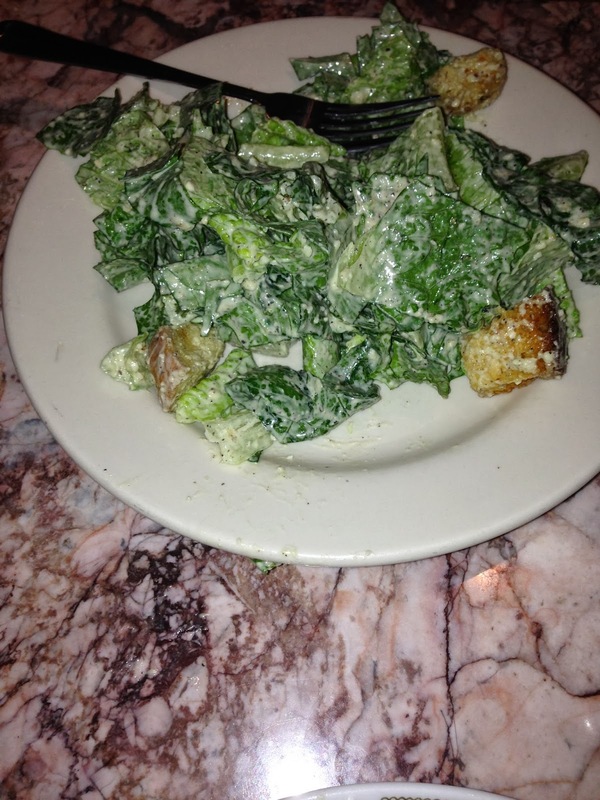 My dining partner let me try her Caesar salad. The greens were fresh, crisp and the dressing a perfect balance of creaminess, garlic, cheese and stuck to the greens perfectly. For dinner I ordered the chicken Marsala over linguine. I do judge an Italian place by it's chicken Marsala and this was excellent. 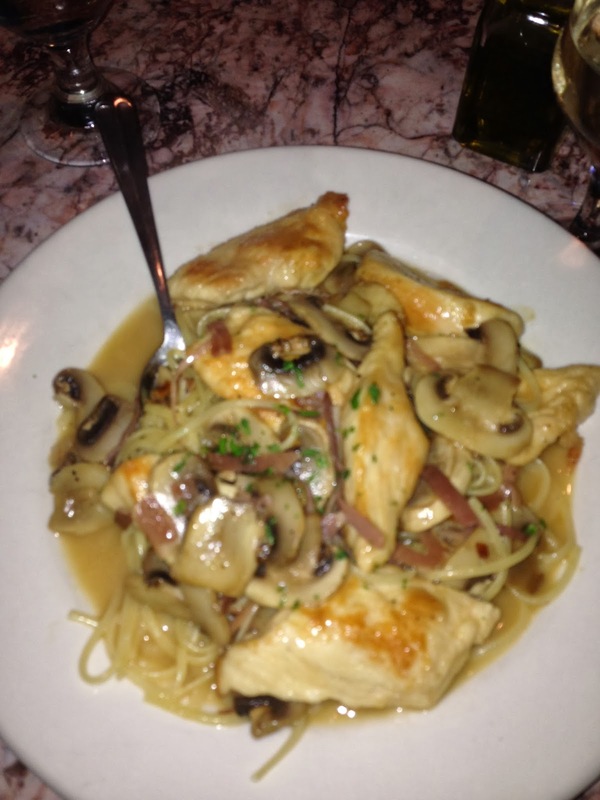 They an abundance of perfectly golden sauteed chicken in a sweet Marsala sauce. There was some pancetta too for added flavor and a lot of fresh mushrooms. This was the best Marsala I've had in a while! My dining partners ordered butternut squash torteloni and pasta with eggplant. 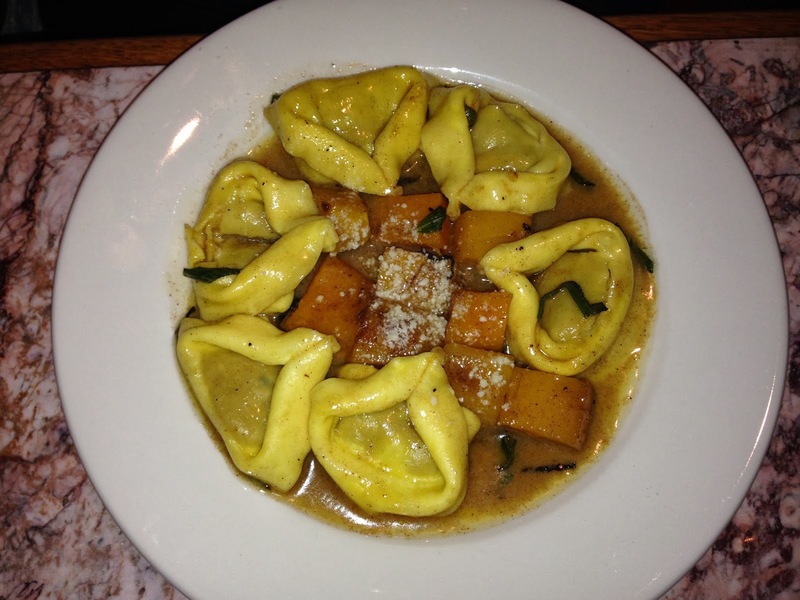 The torteloni was hand made over sized tortellini shaped pasta and tasted like thanksgiving. There were also chunks of squash on the outside. The eggplant pasta dish was described as a healthier eggplant parm. All in all, it was a great night out. The food was perfect and very reasonably priced for the stellar food quality. Looking forward to visiting Panza again soon. Can't wait to see what their seasonal options will be.